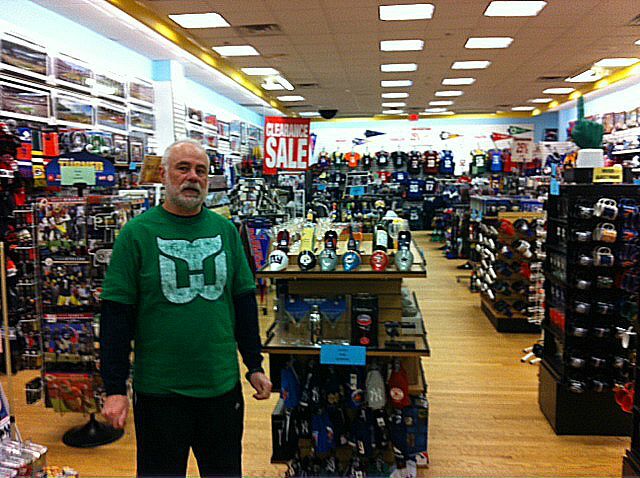 I had the occasion the other day to visit one of my favorite stores, known for its wide selection of Hartford Whalers merchandise. 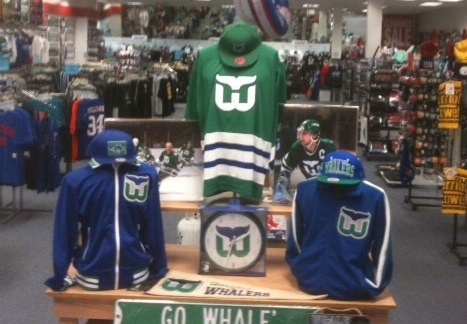 Parade of Novelties in the mall in Meriden sells hats, shirts and various tchotchkes emblazoned with the best logo in sports, along with other teams, too. 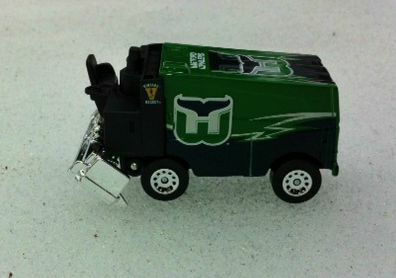 This time I picked up an awesome toy for my son, a Hartford Whalers Zamboni, that will no doubt soon be lumbering down his Hot Wheels tracks alongside Lightning McQueen. Parade of Novelties is the brainchild of Ihor Stelmach, a die-hard Whalers fan who tells me his customers come from all over to get their Whalers fix. He has some unique Whalers stuff in stock, although he’s a bit depleted after what he called a stellar holiday season. Stelmach used to have a store in the Westfarms Mall and I would love to see him expand his business and return to Metro Hartford by opening up shop in the capital city somewhere, maybe the XL Center or Front Street. 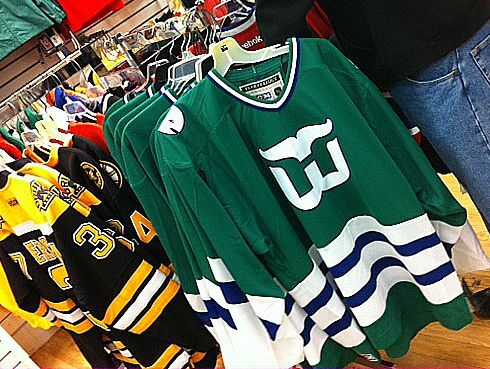 One should be easily able to purchase a Whalers trinket in the downtown area but instead the ancestral homeland of the Whalers is devoid of any stores offering one of the hottest selling logos in the NHL. Brass Bonanza is still a great song. There was actually a Whales Zamboni ( a real one) at a home on Poquonock Ave in Windsor just off of Exit 38. This was about 5 or 6 years ago, he had it parked in his front yard, I stopped and took a few pictures of it. I’ll see if I can find them at some point and upload them for you. Dennis, WhalersFan is correct. Every holiday season, the owner of an original Zamboni with “Let’s Go Whalers” on it is parked out in front of their house on Poquonock Ave in Windsor for like the past ten years. It’s packed away now but will likely be back out in November. I might have a pic somewhere if I do, i’ll send you a tweet.